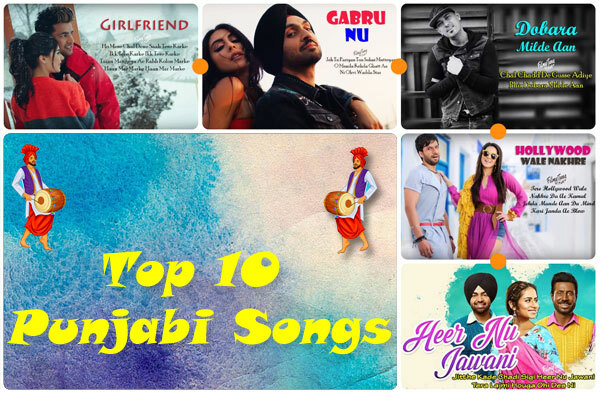 Top 10 Punjabi Songs of the Week 09 – 25th Feb to 03rd Mar 2019 : Pollywood new Punjabi song with lyrics of all latest hit movies and video album music. Guddiyan Patole Lyrics have been penned down by Gurnam Bhullar and he has sung this latest Punjabi video song. The Music Director is V Rakx Music (Rakesh Varma). The Star cast of this Punjabi wedding song is Gurnam Bhullar and Sonam Bajwa. Gal Wakh Hon Wali Song is starring Kamal Khan, Isha Sharma and Nawab Faizi. R.swami is the Video director. Garaia Tera is the Lyricist. Kamal Khan is the Singer. The Music Composer is V Rakx Music (Rakesh Varma). Girlfriend Lyrics have been written by Jass Manak and he has also sung this latest Punjabi video song. The Music Composer is Snappy. It is featuring Jass Manak and Zoya. Chakvi Kadhai Song is starring Rajvir Jawanda and Ginni Kapoor. Harry Singh & Preet Singh are the Video directors. Khan Channa Wala is the Lyricist. Rajvir Jawanda is the Singer. The Music is composed by Desi Crew. Gabru Nu Lyrics have been penned down by Ikka. Diljit Dosanjh is the Singer. The Music Director is Rishi Rich. The Star cast of this Punjabi song is Diljit Dosanjh. Raje Jatt Song is an album song. It is featuring Ravneet and he has sung this Punjabi song as well. Narinder Batth is the lyricist. The Music Composer is Desi Crew. Bas Kar Lyrics have been written by G Sidhu. Mankirt Aulakh is the Singer. The Music Director is Akwinder Singh. It is starring Mankirt Aulakh and Monica Singh. Avex Dhillon is the Video director. Hollywood Wale Nakhre Song is featuring Sunny Leone and Upesh Jangwal. The Lyricists are Sachin Singhania and Tanveer Singh Kohli. Upesh Jangwal has sung this latest Punjabi video song. The Music Composer is Tanveer Singh Kohli. Dobara Milde Aan Lyrics have been penned down by Ricky Khan. Garry Sandhu is the Singer. The Music Director is Lovey Akhtar. The Star cast of this Punjabi album song is Garry Sandhu. Chosen Song is starring Sidhu Moose Wala, Sonakshi Sharma and Sunny Malton. Sidhu Moose Wala is the Lyricist and Singer. The Music Composer is The Kidd. Our experts have created this list on the basis of response. Kindly share your views to improve Top 10 Punjabi Songs of this week. We are trying to serve you better.